This article is about guitars with 6 courses. For guitars with more than six separate strings, see extended-range classical guitar or ten-string guitar. 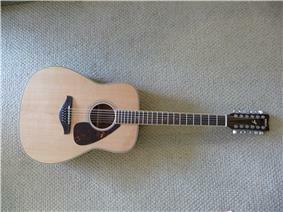 An acoustic 12-string guitar. The example shown is the Yamaha FG720S-12. The twelve-string guitar is a steel-string guitar with twelve strings in six courses, which produces a richer, more ringing tone than a standard six-string guitar. Essentially, it is a type of guitar with a natural chorus effect due to the subtle differences in the frequencies produced by each of the two strings on each course. The strings are generally arranged such that the first string of each pair to be struck on a downward strum is the higher octave string; however, Rickenbacker reversed this arrangement on its electric 360/12. Twelve-string guitars are made in both acoustic and electric forms. However, it is the acoustic type that is most common. 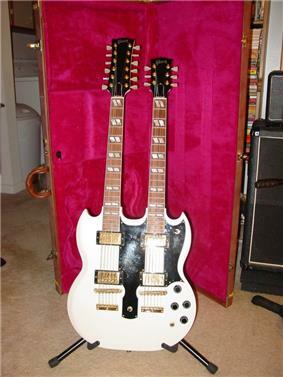 Some progressive rock (Alex Lifeson, Roger Hodgson), hard rock (Jimmy Page) and heavy metal (Dave Mustaine) musicians use double-necked guitars, which have both six-string and twelve-string components, allowing the guitarist easy transition between different sounds. The exact origin of the modern twelve-string guitar is not certain; however the most likely ancestors are the Mexican guitarra séptima and the bajo sexto, a six-course bass stringed instrument used in norteño music of that region, and traditionally tuned like a conventional guitar doubled at the lower octave (like a modern eight-string bass with two additional strings). The earliest twelve-strings were regarded as “novelty” instruments. It was not till the 1920s and the 1930s that 12-string guitars became a major part of blues and folk music, where their “larger than life” sound made them ideal as solo accompaniment for vocalists, especially Lead Belly and Blind Willie McTell. The twelve-string guitar has since occupied rhythm or accompaniment roles in folk, rock, and popular music, since it is more difficult to pluck individual strings on the twelve-string guitar and substantially more difficult to bend notes than on a six-string. The strings are placed in courses of two strings each that are usually played together. The two strings in each bass course are normally tuned an octave apart, while each pair of strings in the treble courses are tuned in unison. The tuning of the second string in the third course (G) varies: some players use a unison string while others prefer the distinctive high-pitched, bell-like quality an octave string makes in this position. Some players, either in search of distinctive tone or for ease of playing, will remove some doubled strings. For example, removing the higher octave from the three bass courses simplifies playing running bass lines, but keeps the extra treble strings for the full strums. The tension placed on the instrument by the strings is high, and because of this, twelve-string guitars have a reputation for warping after a few years of use. Until the invention of the truss rod in 1921, twelve-string guitars were nearly universally tuned lower than the traditional EADGBe to reduce the stresses on the instrument. Lead Belly often used a low C-tuning, but in some recordings his tunings can be recognized as low B and A-tunings. Some twelve-string guitars have non-traditional structural supports to prevent or postpone warping, at the expense of appearance and tone. To reduce this added tension, the twelve-string guitar typically has a shorter neck and fretboard than the six-string guitar, and the fret positions are more closely spaced as well. Its bridge has a larger reinforcement plate for the same reason. Some performers prefer the richness of an open tuning due to its near-orchestral sound. The usual gamut of guitar tunings are also available; additionally for a very complex plucked-string sound, the 12-string can be set to standard tuning (or possibly an octave lower), then the top two string pairs can be tuned to whole-tone intervals instead of in unison, as done by Michael Gulezian. Ralph Towner of Oregon was known to tune bass courses to the upper fifths and trebles to the lower fourths instead of octaves and unisons. Lead Belly and some other players have doubled the lowest course two octaves above instead of one, producing a third string in unison with the top course. The greater number of strings complicates playing, particularly for the plucking (or picking) hand. The gap between the dual-string courses is usually narrower than that between the single-string courses of a conventional six-string guitar, so more precision is required with the pick or fingertip when not simply strumming chords. Note bending and some forms of extended playing techniques are also complicated by the presence of doubled strings. The double ranks of strings of the 12-string guitar produce a chorus effect, due to the fact that even though the strings are tuned to exactly the same pitch, they can never vibrate at the same time, that is they vibrate out of phase, this is known as a phase difference. When the effect is produced successfully, the result is a sound that resembles strings that are slightly detuned. The interference between the out of phase vibrations produces a phenomenon known as a beat that results in a periodic rise and fall of intensity that is, in music, often considered pleasing to the ear. Pete Seeger described the distinctive sound of the 12-string guitar as "the clanging of bells". The effect is more apparent when listening to notes that sustain for longer periods of time. The Nashville Tuning attempts to emulate the chorus, or jangle-like quality of the twelve-string guitar on a six-string guitar by tuning the last four strings an octave higher. This is normally achieved by using the higher octave string for those four courses from a 12-string set. The tuning is commonly used in recording studios to double-track an existing guitar to achieve a natural 12-string effect. Pink Floyd on "Wish You Were Here"
Greg Lake on “Lucky Man" and “Still... You Turn Me On"
Eric Clapton of Cream on "Dance the Night Away"
Nick Valensi of The Strokes). Dave Matthews (Dave Matthews Band) uses one for several songs in the band's catalog. Alex Turner (musician) of Arctic Monkeys on "Do I Wanna Know?". Premonition guitarist Cory Stuteville and former Genesis guitarist Anthony Phillips. Tony Banks, Mike Rutherford and Steve Hackett all played the instrument on Genesis albums in the 1970s. Richard Fidler of the Doug Anthony All Stars used 12-strings when playing live, however the guitar he used was tuned a whole step down, so the tuning became dDgGcCfFAADD. Les Fradkin and Johnny Marr (The Smiths). Bruce Springsteen has used a custom built 12-string Fender Stratocaster numerous times in concerts starting with the 2002 The Rising tour. Springsteen then used a 12-string guitar on the song "Surprise Surprise" on the album, Working on a Dream. Most performers play the 12 string guitar as a rhythm instrument due to the addition of 6 more strings, 4 of which are an octave above the lower strings, the 6th, 5th, 4th, and 3rd strings. This creates the unique, full sound often heard by listeners that two guitars are being played and not just one. Very few players of the 12 string play the instrument in the finger picking style due to the difficulty of playing each string individually. Leo Kottke and Guthrie Thomas many consider masters in the finger picking style on the 12 string guitar as each are capable of playing all 12 strings as individual strings. In 1963 acoustic “folk” music was becoming more mainstream in the United States. One folk/blues/occasional jazz group, The Rooftop Singers, led by Erik Darling, formerly of The Weavers and an associate of Pete Seeger, recorded an old song "Walk Right In" which featured a strong opening “hook” played on the 12-string guitar. This song made it to the top of the pop charts and introduced millions to the 12-string sound. ^ Smith, Richard R. (1 September 1987). 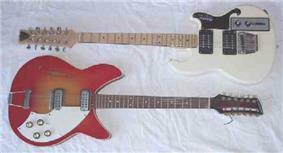 The history of Rickenbacker guitars. Centerstream Publications. p. 77. ^ "English Settlement: Information from". Answers.com. 12 February 1982. Retrieved 13 October 2012. ^ "Dave Gregory Interview". Thegigrig.com. Retrieved 13 October 2012. ^ "Pete's Gear: Pete Townshend Guitar Equipment History | Pete Townshend’s Guitar Gear | Whotabs". Thewho.net. Retrieved 13 October 2012.